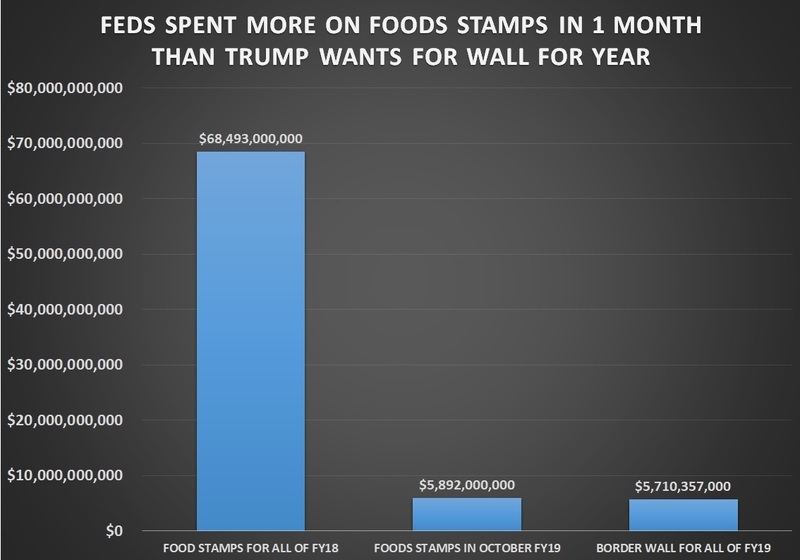 (CNSNews.com) – The federal government spent more money on the food stamp program in October, which was the first month of fiscal 2019, than President Donald Trump now wants the Congress to approve for the border wall for the entirety of fiscal 2019. In October, according to the Monthly Treasury Statement, the federal government spent $5,892,000,000 on the Supplemental Nutrition Assistance Program (SNAP), which is also known as the food stamp program. In November, according to the statement for that month, the federal government spent another $5,428,000,000 on the food stamp program, bringing the total so far for fiscal 2019 (after only two months) to $11,320,000,000—or an average of $5,660,000,000 per month. In fiscal 2018, which ran through September, the federal government spent $68,493,000,000 on the food stamp program. By contrast, the continuing resolution passed yesterday by the House of Representatives, which includes the money Trump wants for the wall, provides $5,710,357,000 for that purpose. That is $181,643,000 less than the federal government spent on the food stamp program in the month of October alone and about one twelfth (or 8.3 percent) of the amount the government spent on the food stamp program for all of fiscal 2018. On the Senate floor on Wednesday, Senate Minority Leader Chuck Schumer (D.-N.Y.) said that $5 billion for the wall is “exorbitant. “[T]he president held out for $5 billion for his wall, at the exorbitant cost of $31 million per mile, straight from the American taxpayer’s pocket,” said Schumer.